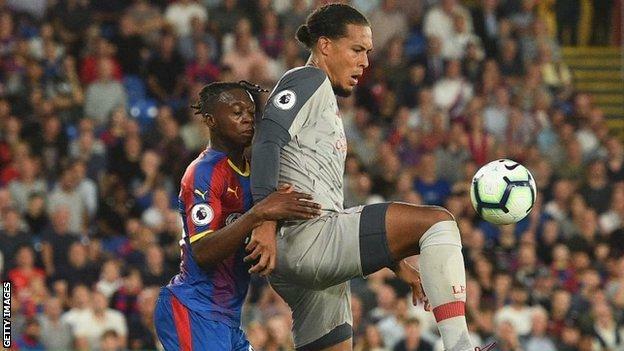 Liverpool boss Jurgen Klopp said he was “not interested in sending a statement” to their title rivals, after victory over hard-working Crystal Palace gave them a second successive Premier League win. The Reds – who finished fourth, 25 points behind champions Manchester City, last season – were worthy winners at Selhurst Park and join five other teams, including City, on six points after two games. The Reds manager said he was unconcerned by City’s 6-1 win over Huddersfield – or any other result. “It’s very early,” said the German. “I couldn’t care less really. We are not in a race with other Premier League teams each weekend. Were the big decisions right? For the penalty, former Liverpool defender Sakho put his arms on Salah and then had two attempts to trip the forward, who went down. Liverpool, who are being widely tipped to sustain a title challenge this season, were never likely to follow up their 4-0 opening-day win over West Ham with a similar result at Selhurst Park against a team in good form. The Egyptian, who was fouled for the penalty and the red card, had a couple of shots blocked and missed with two chips over Hennessey. 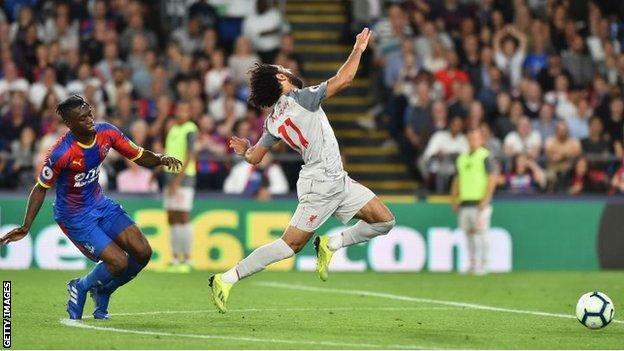 That said, though Wan-Bissaka is quick, it felt as though the Salah of last year may not have been caught – and it does appear he may have lost possession even had he not been fouled. But he still set up Mane’s late goal after Palace committed players forward for a corner. Salah played the ball to Mane, who ran 50 yards before going round the keeper and tapping into an empty net. “In these moments the fuel is really low and maybe the players need a bit of help from an angry manager – ‘run or I will kill you’ – and they did that with a fantastic counter-attack,” said Klopp. Keita looked in good form, with plenty of midfield running, forcing two saves from Hennessey, as well as shooting wide. Reds keeper Alisson kept another clean sheet, saving well from a Luka Milivojevic free-kick. He also showed good skill and confidence to step past Christian Benteke near his goalline in the first half. Simon Mignolet was on the Reds bench, with Loris Karius – who was in the stands – set to join Besiktas on a two-year loan deal. Milivojevic also went close with his free-kick, and Wilfried Zaha, who signed a new five-year deal this week, had a low shot saved in the second half. Benteke never looked like adding to his two goals in 2018 when a shot from 20 yards out went towards the corner flag. Hodgson said: “I thought we pushed them very hard. We should have come in at 0-0 at half-time and the the second half would have been even tougher. We gave them enough problems and we can consider ourselves unlucky to lose 2-0.